Embroiderers' Association of Canada, Inc.: We Have a Winner! The winner of the calendar is Jenny Penny poppy. To everyone who added comments thank you so much. We all enjoyed reading them. 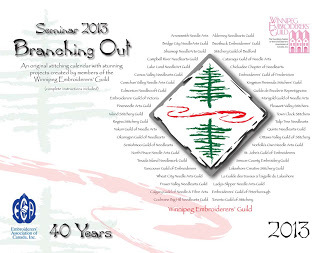 Could Jenny Penny Poppy please e-mail me with the details of where to send the Seminar 2013 Calendar. Thank you for the opportunity to win one of these fabulous calenders!